A modern Hershey is an expensive Hershey, but as long as sales are growing execs still say things are sweet. Hershey is at an inflection point. Or is it a new normal? Impulse buys, a third of Hershey’s business according to U.S. President Todd Tillemans, are down. The company has made multiple acquisitions in the snack category to diversify its offering. And a major foray into digital sales is underway. All of these add up to a fairly big shift for the company and CEO Michelle Buck is looking to come out a winner on the other side. The watchword is "growth," Buck indicated at an August meeting. Analysts had questioned whether Hershey’s “investment mindset” of the past few years is coming to an end in the service of easier comparative sales gains. The answer from Buck and CFO Patricia Little was a resounding "no." "I always like it when there are really good places to invest. When I see us investing in ERP and I see us investing in core capacity here in the U.S., I think we’re really lucky to have great places to invest" said Little. And invest, they have. After all, in order to become a modern, 124-year-old company, Hershey needs a supply chain to match. The Pennsylvania company has invested $150 million in enhanced supply chain capacity in the last year, said Buck on last week’s earnings call. Hershey also began to onboard a new SAP ERP earlier this year, plus all the small changes needed to support selling partners and even facilitate some direct to consumer fulfillment online. And further supply chain improvements are on the way. 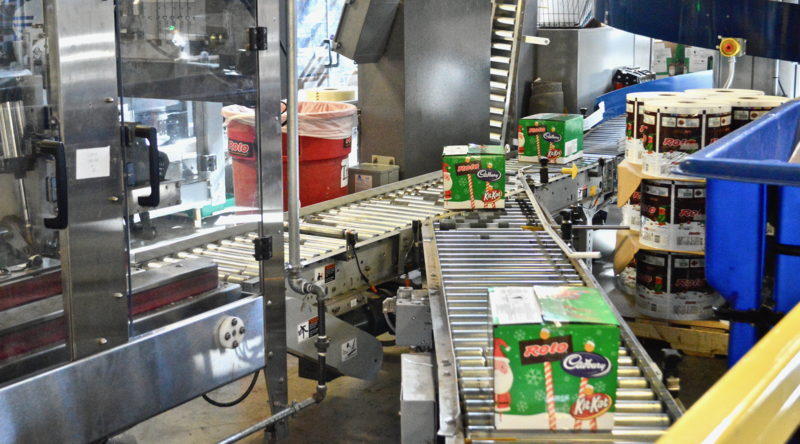 On a recent visit to Hershey’s Old West Chocolate Avenue plant, Supply Chain Dive spoke to executives about what all of these efforts to modernize — with a focus on digital expansion — means for the company’s supply chain. Christmas comes pretty early at Hershey as big clients like Walmart send in their seasonal orders six months in advance. Hershey takes a holistic view of the relationship between digital and in-person sales, believing a strong e-commerce presence can generate in-store sales. "There’s no real hard science yet about the offline attribution, but everyone knows that online sales are scaling. They’re now only about 2% of consumables, but we think they will go 5-7% over the next three or four years," Tillemans told Supply Chain Dive. Working with retail partners, Hershey has learned consumers require the in-store assortment and the digital assortment at each retailer to be identical. "A lot of people are 'web rooming' — where they get information and might even build a shopping list and then they’re filling those in physical tripping," Tillemans explained. Keeping those assortments the same, especially with the high pressure of selling through seasonal items (another third of sales) require a higher level of coordination and more precise execution to make sure that the online experience sets up an accurate and exciting expectation for what shoppers will find in-store. "Not only does our everyday product have seasonality, but we also have seasons and that takes a lot of collaboration and work upfront to monitor how this current season is doing," said Tillemans. On the product side, Hershey is now designing packaging to pop on phone screens, with the important information in larger type legible in thumbnail images. The assortment itself is somewhat driven by the type of fulfillment available from each retailer, adding even more complexity. "Depending on whether it's pickup in store, ship to home or instant consumable, they’re all different models. You can’t think of digital as one model," he said. If only shipping is offered, average price point goes up since retailers and vendors like Hershey prefer a higher price point. But if buy-online, pickup-in-store (BOPIS) is offered, lower price points may be available. To run it all, Hershey brought in Doug Straton as chief digital commerce officer — the author of this symbiotic strategy. Though its still a tiny fraction of overall sales, executives are excited by the growth. Market share, said Buck on last week’s earning call, increased 1.8% online. "Our initiatives are paying off in 2018. We are increasing trips online. We are trading consumers up to higher price points. And we are driving larger basket sizes, while maintaining our margin profile," said Buck last week, reporting that digital sales were up 60% for the quarter. Hershey's factory on Old West Chocolate Avenue is surprisingly calm just one week before Halloween. But in order to keep growing e-commerce year-round, Hershey had to crack a problem that the candy industry has faced in its home state of Pennsylvania and beyond since the dawn of time: summer. "Up until about a year ago, basically what would happen is that the summer would go dark for one portion of our portfolio," said Straton in August. "That was one of the things that was holding candy back in terms of e-commerce sales." Offering chilled drop shipping direct to the consumer has allowed Hershey to advertise "worry-free summer shipping" and brighten up the dark spots in the calendar. "We’re taking away a barrier and enabling year-round growth and this summer was the first time we’ve been able to do that," said Straton. Making the numbers behind cold-shipping direct to consumer can be a challenge, but Buck insisted in August that margins for digital sales are “quite comparable” to the company's overall gross margins. "We are laser-focused on margin," she said. 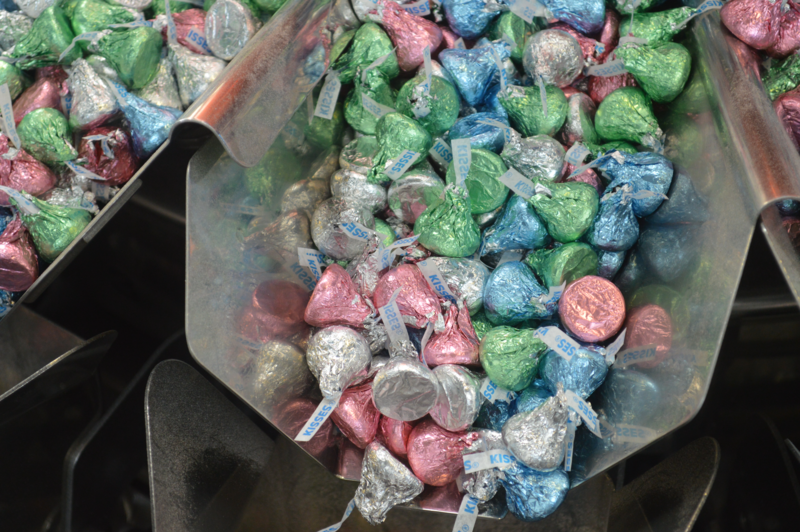 Easter kisses are packed at a Hershey plant in Hershey, P.A. With more manufacturing capacity, software upgrades, substantial M&A, dedicated resources for just a few basis points of overall sales and direct-to-consumer fulfillment, it’s no wonder the Hershey company is raising prices. It’s been widely reported that next year, the Hershey Company will increase prices on one-fifth of its products by 2.5%. Margins have been under pressure for about a year, said Little at the August meeting, and largely from rising freight costs. "We started to feel the impact of that about a year ago. And that has certainly continued, and I don't expect that to change going forward into next year, because the structural reasons that freight costs are higher are not going to go away, in terms of some of the cost pressures that those give us," said Little. Whether driven by permanent "investment mode" or rising freight cost with no end in sight, a price increase is coming. As Buck and Little said, to them it will all be worthwhile if these changes lead to growth. Supply Chain Dive Halloween at Hershey: A trick or a treat?